MRF is most expensive stocks of Indian stock market. MRF is the largest tire manufacturer in India. MRF stock price as on today (i.e 23/5/2016) is Rs. 32027. You can purchase 10gm gold on behalf of one stock of MRF. In last 6 years, the stock price has increased by 4 times. If we talk in CAGR in past 5 years MRF has given 35.74% return to the investor. If you have money defer purchasing gold invest in MRF stock with target price of Rs 45000. Bosch is second most expensive stocks. Bosch has diversified business and dealing with multiple businesses. CMP of Bosch is Rs 21050. The stock value has increased 4 times in past 6 years. In terms of CAGR, this stock has given a return of 25% in past 5 years. Eicher Motors is third most expensive stock. Eicher Motors is the leader in automotive space and manufacturing multiple vehicles such as commercial vehicles, motorbike etc. Eicher Motors is one or the best-recommended stock for long term. Eicher Motors stock has given magnificent return to the investor. In last 5 years, CAGR return of this stock is 70%. CMP of Eicher Motors is Rs.18682. Eicher motor is very good stock for investment. Page Industries is in a textile company and holding an exclusive license of Jockey International for the distribution. CMP of Page Industries is Rs 13014. A stock of Page Industries has increased 15 times in past 6 years. CAGR return of Page Industries in past 5 years is 51%. You can invest in this stock with a target of Rs.15000. Shree Cements is in the business of Cement manufacturing. CMP of Shree Cements is Rs.13000. A stock of Shree Cements has increased 6 times from 2010. CAGR return of Shree Cements for last 5 years is 47%. Upcoming infrastructure projects and smart city initiative will be beneficial for this stock. 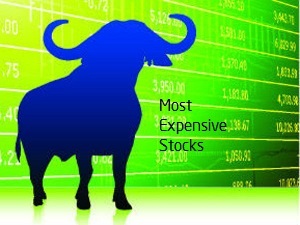 3M India is also on the list of most expensive stocks. 3M India is a diversified technology company dealing in multiple businesses. CMP of 3M India stock is Rs.12774. In last 5 years, 3M India has given 26.33% CAGR return to the investor. Honeywell is one of the most expensive stock. Honeywell produces a variety of commercial and consumer products. CMP of Honeywell stock is Rs.9023. In past 5 years, this stock has given CAGR return of 30.6% to the investor. This stock is worth for investment for the long term. Bajaj Finance is leading finance company of India. Bajaj Finance provides a loan in the consumer segment. Bajaj Finance stock is one of the most expensive stock. CMP of Bajaj Finance stock is Rs 7777. Bajaj Finance is consistent performer stock and giving very good returns to investor year on year. I recommend keeping Bajaj Finance stock in your portfolio. P&G is one of the largest and fastest growing consumer company of India. CMP of P&G is Rs 6393 making this stock one of the most expensive. CAGR return of P&G for last 5 years is 26.30%. Nestle India produce food items. CMP of Nestle India is Rs.5975 and it is one of the most expensive stock of Indian stock market. Last 5 year CAGR return of Nestle India is 8%. No split or bonus shares are announced by a company since a couple of years hence face value of a share is high. Thank you for the excellent analysis Raviraj. In 2011 Eicher Motor share price was approximately 1300 per share, and now its is trading at Rs. 18000 per share. This company with debt equity ratio of 0.02 is definitely an excellent Buy in the long term.